Last week, my mom brought me a pint of fresh blueberries. 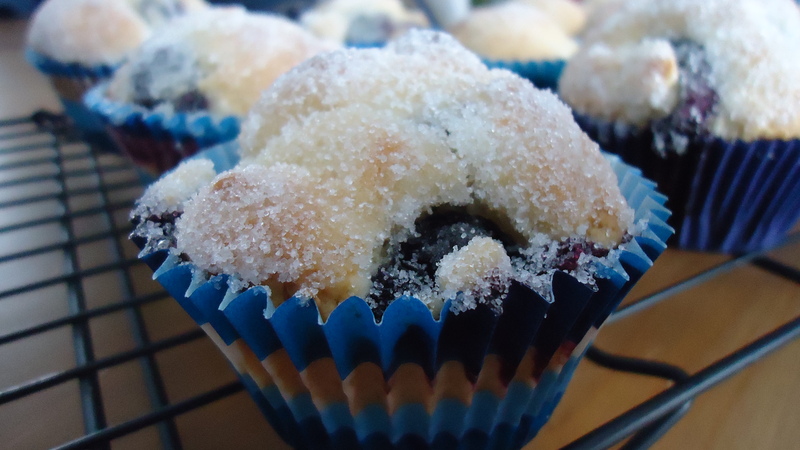 I haven’t baked with fruit very much, but I love blueberry muffins, especially ones with a hint of lemon and a crunchy sugar topping. Line one muffin tin with paper liners. Wash blueberries and dry on paper towels to remove excess moisture. Toss berries with 2 tablespoons sugar and set aside. Sift together flour, ¼ cup sugar, baking powder, and salt in a large mixing bowl and make a well in the center. In a medium mixing bowl combine milk, egg, oil, and vanilla. Add to dry ingredients at once, stirring quickly with a fork until just moistened. Add blueberries and lemon zest, folding in gently, taking care not to break blueberries. Spoon batter into muffin cups and bake for 23 minutes. While muffins are still warm, brush tops with melted butter and dip in sugar.